North Korea has sent a clear message to the international community that it will not give up its nuclear program, following its move to make a third-generation hereditary succession official. 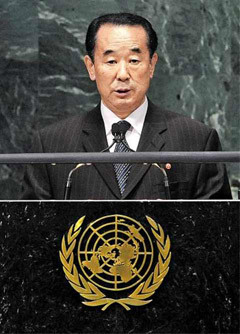 North Korea's Vice Foreign Minister Pak Kil-yon's speech in the UN on Wednesday was clearly directed toward the United States. "As long as the U.S. nuclear aircraft carriers sail around the seas of our country, our nuclear deterrent can never be abandoned, but should be strengthened further," Pak told the General Assembly session. Pak claimed the North is "a responsible nuclear weapon state," and that the country is "willing to join in the international efforts for nuclear non-proliferation and safe management of nuclear material on an equal footing with other nuclear weapon states." The North Korean Workers Party leadership a day earlier promoted Kim Jong-un, the son of the country's leader Kim Jong-il, to four-star general and vice chairman of the Central Military Commission, signaling that the "Songung" or "military-first" doctrine remains firmly in place. In fact, the preface of the party regulations was amended for the first time in three decades to include the term "Songun." Kim Jong-il's sister Kim Kyong-hui was also promoted to four-star general and her husband Jang Song-taek became the second most powerful man in the regime to provide support to Kim Jong-un. Pyon Yong-rip and Ju Kyu-chang, who were key players in the development of nuclear weapons and missiles, were kept near the central power base. Both of them were slapped with travel bans by the EU early this year. The U.S. for its part made it clear that its position on the North's nuclear issue remains consistent -- that it should live up to its obligations to dismantle its nuclear program -- regardless of change in its leadership. "We need to see a very clear signal that this new leadership -- or some structure in North Korea -- accepts the very clear commitments that North Korea made in 2005 to denuclearization," said Kurt Campbell, the assistant secretary of State for East Asia. "We believe in the current environment, the most important thing is for North Korea to reach out and get in the process of re-establishing a more forward-looking relationship with South Korea." Pak's speech was the first official response after the reshuffle of the North Korean leadership.